Perennial. Zone 2. Malvaceae. North Africa, Western Asia, Europe. This ancient medicinal herb makes a pleasant border background plant. It’s definitely not showy but it has a certain presence about it. The plant forms a long-lived, many-branched clump of 6 foot tall stems lined with maple-leaf-like, soft, grey-green foliage. The rather small, inconspicuous, white to pale purple flowers like miniature single hollyhocks are produced over a very long season, from summer well into fall. An “innocent” plant, as the old herbalists called it – all parts are safe to consume, with no harmful properties. The soothing properties of the plant made it a popular and reportedly effective treatment for sore throats, and it was one of the herbs grown in the monastery gardens of Medieval times. The plant was also used to produce original “marshmallow” confection, with the roots yielding a mucilaginous sap which was mixed with honey by the ancient Egyptians to form a candy. French confectioners of the 1800s whipped the root extract with sugar to form a frothy dessert. Eventually the plant sap itself was replaced with egg white and sugar, and the popular snow-white marshmallow candies we know today were developed. 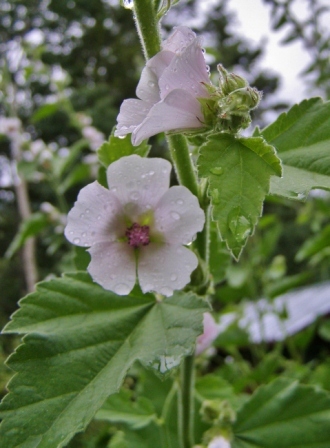 A highly adaptable clump former which thrives with some moisture and can tolerate some standing water, Marsh Mallow is just as happy in dry garden soils, though it will be shorter. The occasional seedling may appear, but never enough to cause a problem. Sun to light shade; average conditions.